GMB is extremely worried about the rising level of violence and aggression in schools. We are seeking stronger action from head teachers, governors and Wiltshire Council, and it would be very helpful for GMB to have recent evidence of your experience in Wiltshire schools, whether schools run by the council, or Academies. Please complete this survey, and encourage your work colleagues to complete it as well. The survey is open to all staff working in schools, whether you are a member of GMB or not. There is already a policy in Wiltshire, but we believe that it needs strengthening, and that it is not being implemented. For that reason, we are also launching a survey across Wiltshire schools to get evidence of how serious the problem is across the county. If you work in a school in Wiltshire, please complete the survey, and encourage work colleagues to do the same. The survey is open to both GMB members and non-members. GMB will be approaching academies and we have already spoken to Wiltshire Council seeking to extend the policy to them. GMB believes that the Swindon policy is superior to the arrangements currently in place in Wiltshire. Having a policy to protect staff is a useful step forward, but the challenge will be to ensure that it is implemented by school management. GMB will continue to take up issues of violence and anti-social behaviour towards school support staff from pupils and parents. Please contact GMB is you need support. GMB is the union for staff employed by the agency, 24/7 Recruitment, at the Marks and Spencer (M&S) distribution centre in Swindon. 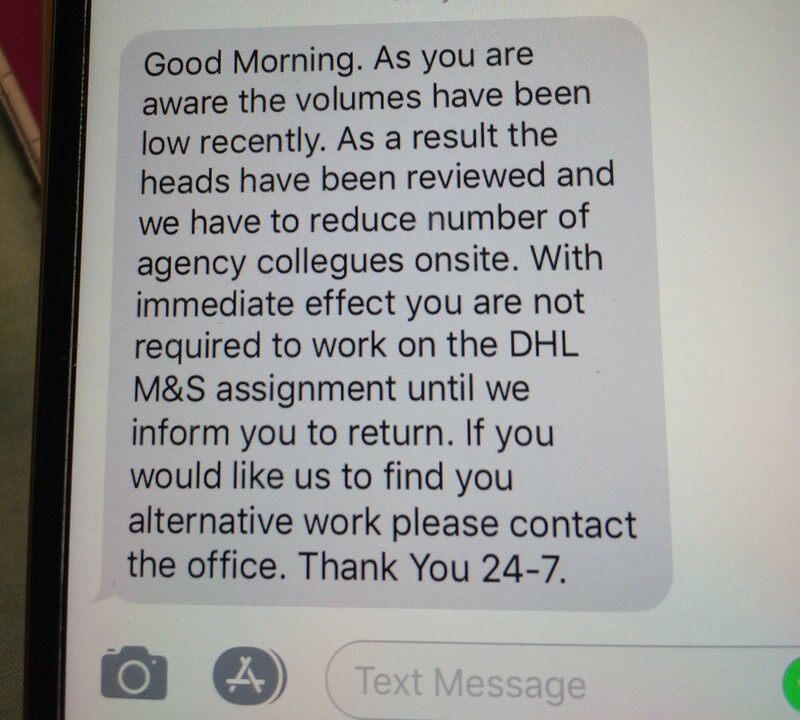 Several GMB members received a text message over the last two days, saying that they would not be required to work on the M&S contract until further notice. GMB have spoken to 24/7 for an explanation. As you know, the agency provides staff to DHL, who run the distribution centre on behalf of M&S. DHL informed 24/7, at very short notice, that agency staff were not required, and DHL advised that 24/7 needed to act immediately. This is due to very poor business performance by Marks and Spencer, both on food and clothes, which means that work volumes are very low. As they had to act very quickly, 24/7 selected the staff at random. GMB understands that it is unfair that some of those selected have worked there for many years, while some newer staff are still working. However, under English law, employers cannot use length of service as a reason for choosing between people, as this could be regarded as discrimination. GMB has every sympathy for the situation that you are in. Unfortunately, the reason for the reduction in workforce is the poor business performance of Marks and Spencer, which is a problem that GMB cannot solve; and 24/7 are behaving in the way that employment agencies normally do in the UK. As you have an agency contract, 24/7 are offering to find you work at other contracts that they have in Swindon, particularly Iceland and B&Q, where 24/7 currently have vacancies. You would then be given priority to return to M&S when business improves. This is allowed by both the old contract and the new contract, where each of these different sites is known as an “assignment”. If you take work with 24/7 at Iceland or B&Q, then you will still be working for 24/7, and your length of service will continue uninterupted. The snapshot survey also showed that in mainstream schools 25% had been spat at and 46% had suffered verbal abuse. In special schools for pupils who need additional support, 94% of staff had suffered violence. GMB initiated a survey of school support staff after a GMB member had their finger dislocated by an 8 year old pupil and felt the school’s response was inadequate. “Following the survey, GMB were extremely concerned that 25% of staff reported they were afraid or apprehensive at work, but when they report incidents or concerns to schools management, half of our members reported that the response was inadequate. GMB felt that school leadership teams did not have sufficiently clear guidance on how to deal with violence and aggressive behaviour towards staff. “The policy unambiguously states that violence, and aggressive and anti-social behaviour towards school staff is unacceptable, and sets out in detail the responsibilities of school governors, head teachers and other school managers, and of staff themselves, to manage and reduce risks. The uncertainty of the outcome of Brexit negotiations impacts us all, across all sectors of work and all bands of pay. 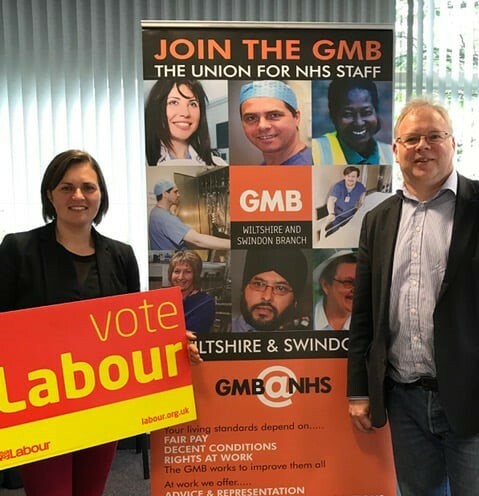 In a town like Swindon, there are two possible futures: a bright future of high employment, high wages and high productivity supported by employment rights and representation through trade unions; and a future under a Conservative government that reduces trade union representation, repeals the employment rights enshrined in EU law, and enters trade deals that allows unregulated third country access to our labour market. Swindon’s geographical location, its proximity to major road networks and Heathrow airport, as well as the prospect of an electrified rail-link to London and Bristol make it a perfect town for business investment, business start-ups and manufacturing. Swindon already attracts a high rate of foreign investment. This is because of where we are but also because wages are so low: employees in Swindon are paid on average 18.3% less than in other nearby towns. In comparison with Bristol for example, an employer can expect to save approximately £4209 per employee per annum by employing a worker in Swindon. The combination of high productivity with low wages is an indicator of workforce exploitation. The solution to Swindon’s brighter future is for wages to rise to make us a high-wage high-productivity town. What to do then? Firstly, introduce a minimum wage of £10 per hour that will actually meet the rising cost of living: rising rents, and rising food and fuel prices. Secondly, enshrine employment rights in British law, repeal the Trade Union Act and allow unions access to the workplace to support their members. Thirdly, ban zero-hours contracts and give all workers the same rights from day one of employment, whether on temporary or permanent contracts. Hard won rights for employees must not be eroded as we leave the EU, but should continue to protect the workforce from exploitation and wage suppression. Cooperative business models will also increase employee rights and decision-making in local business. Employee representation on boards and the right to first refusal to buy a company that is being dissolved or sold will increase and improve rights in the workplace. We are at the crossroads of these two possible futures and Labour is promising it will be bright for the workforce in Swindon. Published and promoted by Wiltshire and Swindon GMB on behalf of Sarah Church, both of Suite 22 Cherry Orchard North, Swindon, SN2 8UH.